I joined the ISAAC project in mid-august and I am proud and pleased to be a part of such an interesting international project. Now is the time to report, what have achieved during these weeks. I am part of the electronics team and I have been brought in to the project to work on the tracking system, which has been theoretically designed before. The first step of implementing this design was to test the SmartFusion2 which combines a FPGA and a microcontroller, taking the flexibility and processing power accordingly. First I familiarized with the software development kit which is new to all of us, then implemented some simple designs, some of which will be used in tracking system, like SPI and UART communication. Last week I have also integrated Viktor’s motor controller, although the communication is a bit sluggish right now. Plan to optimize it this week. I have also implemented a time measuring method, so we can diagnose, which parts of the software are sluggish, if we need. The tracking system design in general has changed a bit up to this date. First of all instead of 4 FPGAs there are two plus SmartFusion2. First FPGA is dedicated to the camera and video processing, after which it transfers the hotspot coordinates to the SmartFusion2. 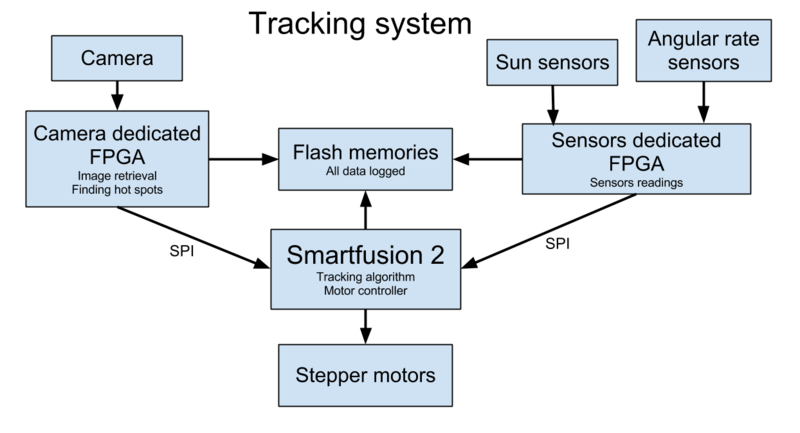 Second FPGA gathers sun sensor and angular sensor readings and transfers the data to the same SmartFusion2. SmartFusion2 then tracks the hotspots and controls the two stepper motors.